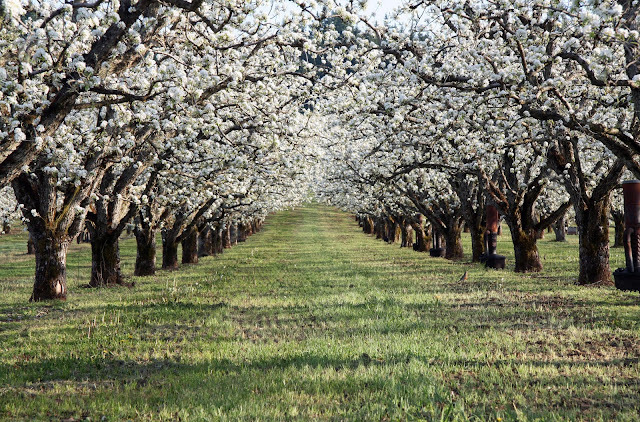 The valley is in full blossom as the fruit trees stretch their arms after a long sleepy winter, smiling at the warming days of spring. It is one of the most special times of the year. 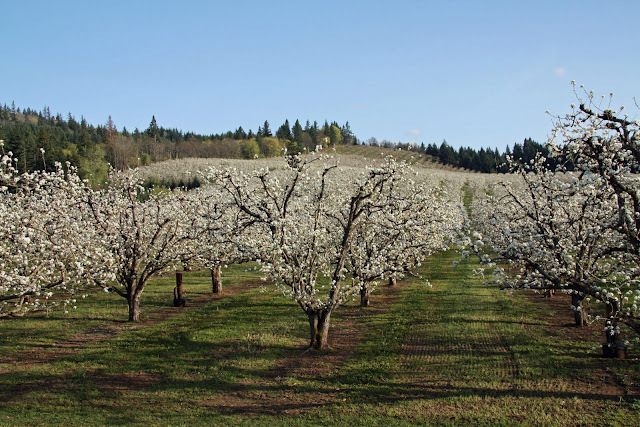 This orchard is very special to me as these trees are our friendly neighbors. If one were to walk down this row, up the hill and through the trees...they would arrive at our house! 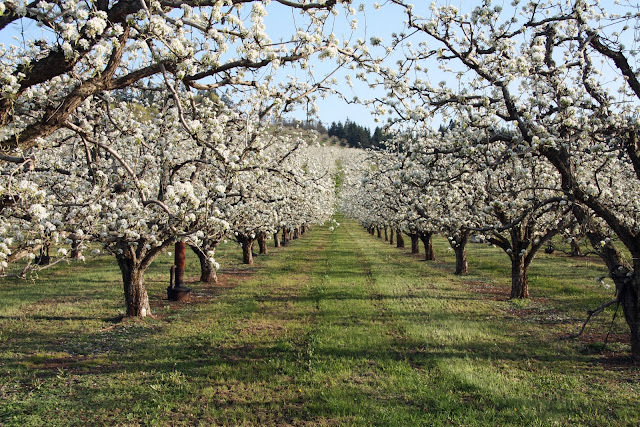 The rolling hills draped with these beautiful blossoming fruit trees provide us with a delicious landscape... from blossom to fruit. Here's another orchard across the way, hugging this narrow country road. This is one of my favorite barns in the valley, especially when it's surrounded by twinkling pear blossoms and the green grass of spring. I'll return here when the fruit is growing, and their scent is strong and sweet. Trina, how gorgeous it is where you are!! It reminds me of my small home town, with rolling hills and trees everywhere. I miss that landscape. It is a gift to have all those trees for neighbours. There can be disadvantages of living out of town, but I think they are outweighed by beauty!! I didn't think that even 10 years ago - now different things (like peace and quiet, and birdsong!) matter!! Oh, I love the photos, especially the one with the barn. Great barn! Beautiful images. We have blossoms here too, falling from the trees in the breeze like confetti. The garden is blanketed in fallen cherry blossoms...sooo pretty. I'd love to have a driveway that looks like Photo #1. And that backlit tree against the gray barn photo is gorgeous! A sweet hello from Frog Hollow Farm! This is a simply beautiful and inspiring post! 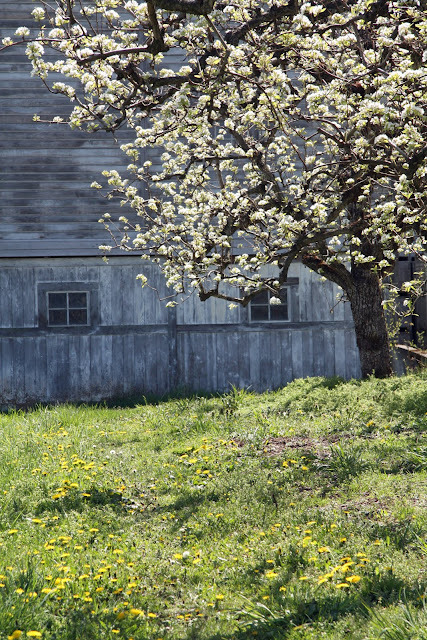 There's nothing lovelier than seeing a old apple or pear tree in full bloom. And when the wind blows and the blossoms begin falling, it's just magical! Ciao, bella! What a special magical place. Reminds me of the scene in Anne Of Green Gables when she first arrives on Prince Edward Island. Have you seen it? Such a sweet movie, watched it several times. Just beautiful and lucky you! I love that repetition of the trees....just lovely. Oh my goodness this place looks stunning. Thanks for posting. Spectacular shots, Trina. Pop over and see my Autumnal garden! Trees are among the most beautiful things in nature, and I especially love seeing trees with blossoms. Gorgeous post! Also, I would love to see a shot of your house as you are approaching from the orchard. I bet it's magical! So blessed you are to live in such a beautiful place. Anxiously awaiting more photos throughout the season! Paintings or photographs? Beautiful trees beautifully captured. What beautiful neighbors you have. And the barn? That barn is pretty special, too. I can tell. Enjoyed seeing these photo's. The spring blossoms look really beautiful. Loved seeing the landscape around where you live. Hope you are well. Breath-taking! O so beutifully stunning. Just gorgeous!! The barn looks fabulous too! soooo lovely! I think if I were you I would get NOTHING done this time of year for all the under-tree-sitting I would be doing! How absolutely gorgeous...I wish I could walk down that row....thank you for sharing this, god nature is amazing isn't it? And that barn is beautiful too. How stunning! 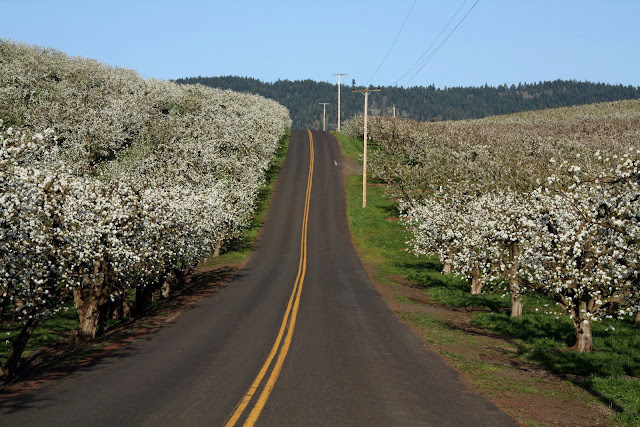 I love the time of year that you drive through the blossoms, and a fishtail of pink blossoms follows your car. This is beauty in bulk...lucky you! Lovely! Just lovely! Hubby and I are thinking of planinting a row of these down our driveway. Trina, you live in the most beautiful place! What gorgeous blossom trees - here in Brisbane it's too warm to grow trees like this, so I'll have to be content with looking at your beautiful photos. Beautiful! and the photos are great as always! Stunning! What kind of fruit are they? Apple? I have a beautiful little oil painting of rows of apple trees in bloom...looks very similar! The last photo, the one with the barn in it, is FANTASTIC!!!!!!!!!!!! Lovely white blossoms so welcome after white snowflakes have melted! I love the scenery in the photos.